I find North Korea to be a fascinating case study; I’ve read books about peoples experiences there (for class and outside of class), watched documentaries, and followed news coverage on the country for years. So when I saw an article about tourism in the DMZ I knew I had to write about it! Kim Il-Sung, the “Great Leader” of North Korea, was born on April 15th, and so the North has been in a celebratory mood lately—barring, of course, the shocking announcement on Monday the 23rd that the government would conduct “special actions” that would destroy South Korea within minutes—and has decided to re-open the Mount Kumgang area for tourism and pledged special privileges to tour firms willing to go there. Tours have been banned at Mount Kumgang since July 2008, when a South Korean tourist was shot and killed by a soldier, but now the North Korean government is working hard to show foreign visitors a good time. Gift shops sell “See you in Pyongyang” T-shirts and souvenir blueberry-flavored North Korean liquor, and everyone is smiling, including the two North Korean soldiers that accompany tour groups on their tour of the front line. There are even coin-operated binoculars for tourists to view the other side. A tour of the North side of the DMZ is pretty cheap, too, at only $20; easily affordable for tourists, but a huge sum in a country where the per capita income is under $2,000 a year. That low income is one of the main reasons the North is pulling out the stops to encourage tourists to visit. 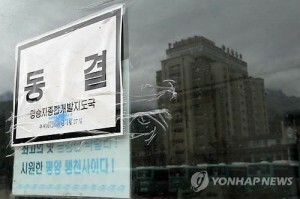 Tourism at Mount Kumgang once earned the North tens of millions a year from South Koreans eager to see across the border, but after the shooting relations between the two countries deteriorated and tourism came to a grinding halt, as a South Korean country, Hyundai Asan, owned the resort at Mount Kumgang. So last year the North Korean government, desperate for an infusion of cash, stripped Hyundai Asan of its exclusive right to run tours to the area and began encouraging tourism once more. South Korea has not been pleased with this decision, particularly after the North’s recent threat to reduce the South to ashes, and has been lobbying for a ban on all foreign tourists going there. I have to admit, I’m not quite sure how I feel about North Korea turning the DMZ into a tourist trap, complete with gift shops and amusement park rides. The DMZ is an incredibly tense area, with hundreds of thousands of soldiers and fields of land mines, and there’s always a threat that any minor incident could spark major conflict. All the smiles can’t mask that danger—tourists have to sign a document acknowledging that they are entering a hostile area and there is the possibility of injury or death. Also, there is no chance that tourism in the DMZ can be considered “responsible” or “sustainable,” and I have to wonder how much of the money tourists bring in actually reaches the North Korean people. Then again, any money is better than no money, so even if only a small fraction of the foreign cash reaches the general population of North Korea it will go a long way in a deeply impoverished, starving country. Plus I am really, really curious and would like to see at least some small part of North Korea. What about you? 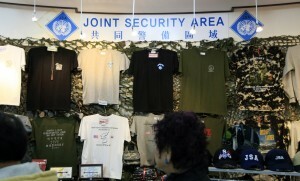 How do you feel about tourism in the DMZ? What are your concerns, or your suggestions?